Home / Stories and Information / FAQs / Coloured Stones / Emerald. The May Birthstone. 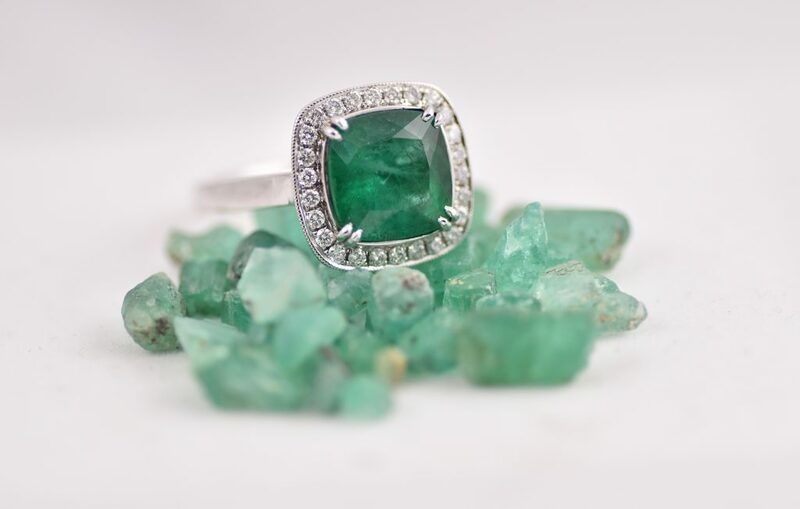 Emerald has been a favourite in jewellery design for centuries, from when Cleopatra wore the gem in her royal adornments, to today, being used as an alternative to diamond in engagement rings. But what are they and where did they come from? Here are a few facts about the May birthstone. Emerald is a variety of the mineral Beryl. Aquamarine also belongs to the same mineral family. On the Mohs Scale of hardness, Emerald measures 7.5-8 meaning that it is suitable for everyday wear, although it does require a bit more care than a diamond for example, which is harder and measures 10. Emeralds were first found in mines in Egypt. These mines are dated back to at least 330 BC. The majority of emeralds are mined in Colombia, Brazil and Zambia. Its name comes from the ancient Greek word ‘Smaragdus’, meaning green. The colour green is thought to relive stress and eye strain. Famous Emerald jewellery includes; Elizabeth Taylor’s Emerald and Diamond Bulgari suite given to her by Richard Burton while filming Cleopatra in Italy. And, First Lady Jackie Kennedy’s diamond and emerald engagement ring. 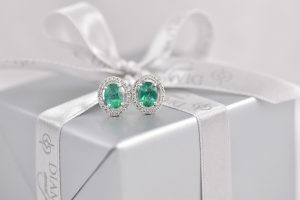 Looking for a birthday gift featuring the May birthstone? Shop our Emerald jewellery here. Like the jewellery featured in our images? Find the Earrings and the Ring in these links.